My daughters, Kylie and Cayla, wanted to have a unique costume this year. 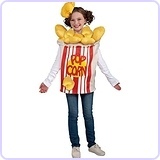 We came up with the idea of food and while searching online for candy costumes, we came across the idea of a popcorn costume. 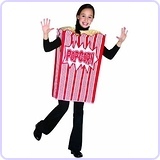 The night before Halloween we started thinking about what goes well with popcorn and the soda idea came up. It took some time but we finally figured out how to make it work. The whole costume (both pieces) cost us less than $10! 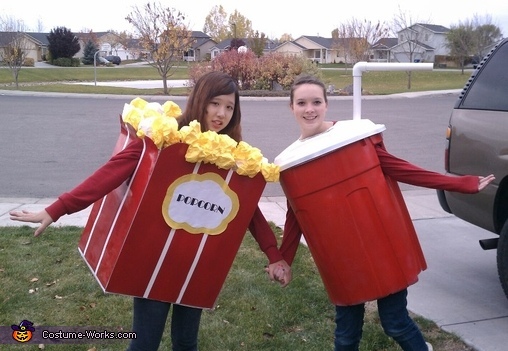 Using a cardboard box and spray painted poster board, the popcorn tub came together pretty quickly. 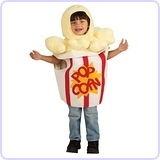 We used crumpled yellow and white paper and hot glued the popcorn to the box. A "popcorn" sign added the finishing touch. The soda cup was actually the easiest piece. Using an old cracked plastic trash can we had sitting out back, we cut the bottom out and made a hole in the lid using a jig saw. We primed the trash can and spray painted it red. Then we drilled a hole in the lid and added a few lengths of PVC pipe with an elbow joint for the bendy straw. Everything in these costumes was reused from things we had lying around the garage. The only items we purchased was the poster board and a 2nd can of spray paint. They definitely turned some heads and even had people slow down and take pictures from their cars! That's not only creative, but very resourceful. Great job! You are a think bank. very intelligent. Good~ idea!!!!. I have never seen such a unique costumes. Wow!! Love it!! Can in borrow it?